Some people use diaries, some journal in app and some just mentally keep a tab of their food intake, exercise and other key areas. I find solace in writting all thats going on. Fitness is no exception. 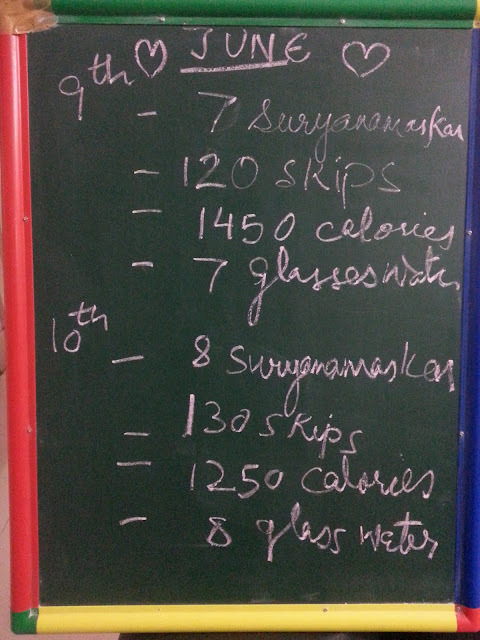 I use this chalkboard n weigh my progress compared to previous day. Just rub off the lastnight jottings n add fresh ones. Keep it honest and doodle all u want. Happy tracking and keep fit. wow.. really cool idea.. skips as in with rope? Try it Supriya, it will make u a child again and it ups your heart rate, which is a good exercise.